The Loop, as you may have noticed, is lousy with Potbellies, Paneras, Corner Bakeries, Einsteins, Au Bon Pains, and Pret a Mangers at every corner, all eager to feed and nourish hoards of office workers as efficiently as possible and make them feel good about the decision to resist the siren call of McDonald's or Chipotle and spend their money on a salad or sandwich they could have just as easily made at home. 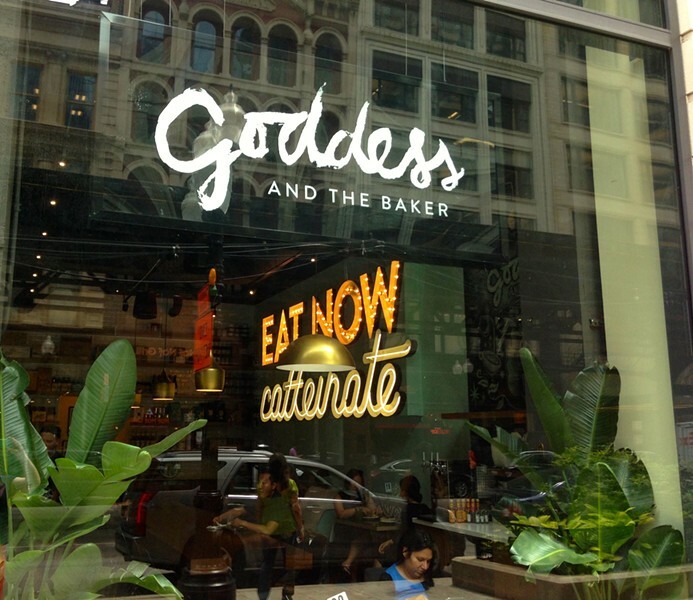 Now we have Goddess and the Baker, an offshoot of the Goddess and Grocer minichain, which has set up shop under the el tracks on Wabash. When a friend and I grabbed lunch there the other day, it was completely packed, not just with the expected office workers but also a few stray members of the stroller brigade and students from the School of the Art Institute, two of whom were consulting earnestly over their laptops about a film project. Goddess and the Baker is a more comfortable place to sit than most of the chain spots, and the food is better. 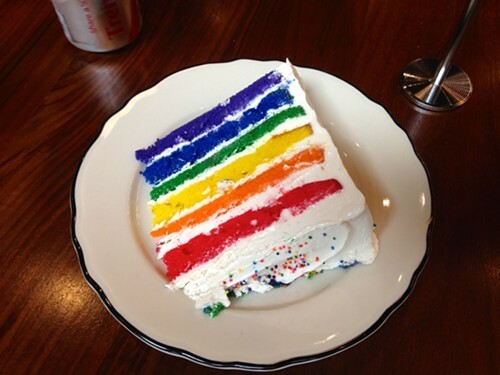 The most dramatic-looking item in the pastry case was the rainbow birthday cake, six layers, each a different bright color. The amount of food coloring that went into it, even considering that it's a white cake, must be appalling, but it's also the sort of food item that makes you not want to think about such things (especially if you were brought up by people who did and would have never, in a million years, let you order something like that at a bakery). Because the cafe was so crowded and the sandwich makers appeared to be facing a sizable backlog, the cake was the first thing that arrived at the table. It sat there alone for quite a while, taunting us (because simply ordering the thing was transgression enough, so we had to wait until the end of lunch to eat it). The rest of the menu is not very fancy or remarkable in any way if you've ever been to a sandwich-and-salad place, but the chicken club sandwich contained a real, bright-red tomato, creamy avocado, and crunchy bacon, and the Thai chicken flatbread actually had a kick to it. These things should not be a big deal—they should be a basic human right if you're paying $10 for a sandwich—but years of Panera have probably done terrible things to our expectations. The cake, when we finally got to it, did not taste quite as good as it looked. It actually tasted a lot like sugar, without any hints of lemon or vanilla that would make it more sophisticated. (Why I expected subtlety in something that looks like that, I have no idea.) In retrospect, I probably should have gotten a doughnut or a cookie and tried the Stumptown nitro iced coffee. And the fact that I am considering this makes me think that next time I have to meet someone for a quick meal in the Loop, this is one of the first places I'll suggest.